So we made it. We've had the largest number of kids ever at the club (560!) this season plus we hosted two brilliant festivals. Great successes have been recorded through all the age groups both in terms of skills and participation, as well as results. The girls squads have been especially fantastic with cup wins and county/national representation for some of the players. 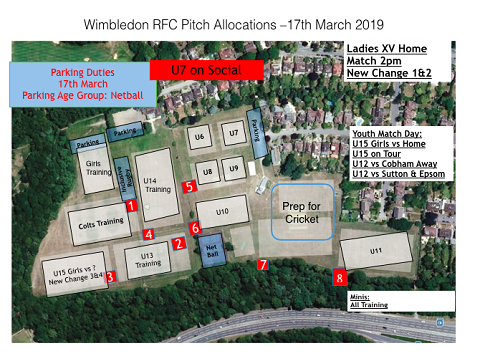 If you want to play girls rugby you really should come to Wimbledon - spread the word! We play modern-style, fast, free-running rugby at Wimbledon where skills and style count. Thanks to all the parents for your support and a big thanks to all those volunteering as coaches, managers and helping run the club on the committee. We'll be back Sunday 1st September 2019 - 10am sharp. If you have time (just a couple of hours a month is all it takes) to volunteer please put yourself forward. As well as a new minis chair, there a few other roles (such as child protection, social, comms, school liaison etc). If you are interested in finding out more please get in touch with Paul Goss (chair@wmrfc.co.uk). More info on the roles are here: http://wmrfc.co.uk/node/1643. Only one game at home for the U12’s against a touring side and the U15’s have their Chairman Waterfall Cup final against Warlingham this weekend away. A big welcome to Ruth, the new club steward. Please say hi when you're next in the clubhouse. Rugby doesn't get bigger than this. 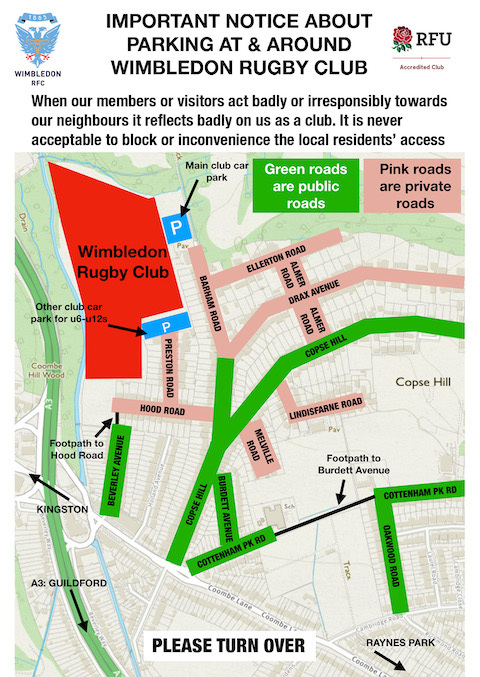 Wimbledon RFC are second in the London & South East Premier League to local rivals Sutton & Epsom RFC. There's just three points in it. Winner of the league gets automatic promotion. You get the picture! Please, please come and support the club this afternoon. Bring your kids in their Wimbledon kit. The sunshine and beer is booked. If you can be there for 2.30 for a guard of honour, fab. If not, kick off is 3pm. Dont miss this. The whole club would appreciate your support today. We are lucky to have a good number of parents volunteer on our club committee. Without them there would literally be no club for the 500+ kids to enjoy their rugby at. We are actively seeking a handful of new parents to take part in the running of the club. Our current minis chair (and u8 head coach), Jon Hall, is moving away from the area this summer. As a result we are looking for a new minis chair. The role requires a commitment of two short evening meetings a month during the season and some email and other occasional work. 4. Secretary for the committee - someone to make sure people know when the meetings are, write up notes and keep the meetings going. 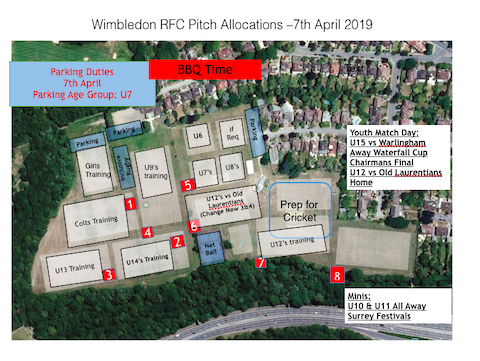 If you're interested in finding out more or throwing your hat in the ring for any of these roles please get in touch with either Paul Goss on 07702 564647 or email youth@wmrfc.co.uk or Richard Castle on 07971 278717 or email secretary@wmrfc.co.uk. Closing date for the minis chair role is Tuesday 23 April 2019. 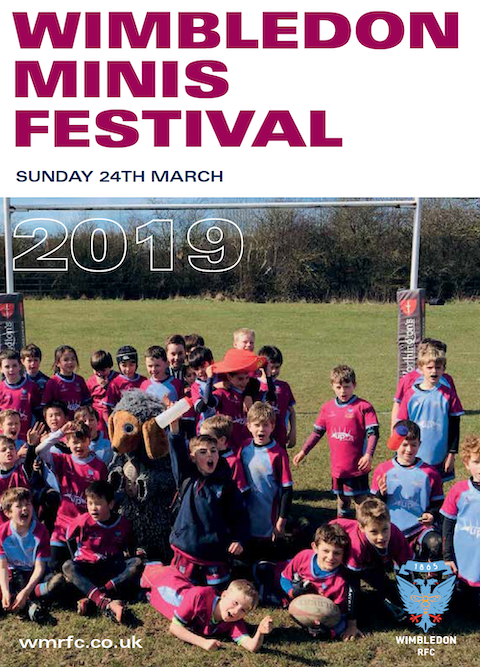 Let's start with last week's minis festival: thank you to everyone who contributed, especially Woody and Scott for a great day out for the kids. 11.15 - U13 through to Colts please. We will sort out those that miss this early next season I suspect so do not worry if you're not at the club on Sunday. Carl, one of the Colts fathers, is taking the photos so please help him by being on time. 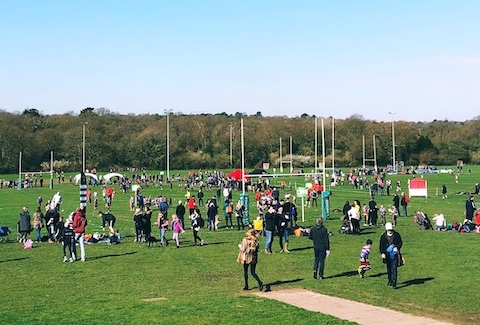 A huge welcome to our guests this Sunday: Rosslyn Park, Whitgiftians, Old Midwhitgiftians, Sutton & Epsom, Guildfordians, Warlingham, Windsor, Kingston and Battersea Ironsides. An even larger number of clubs joining us than for the Autumn Festival. Fantastic! 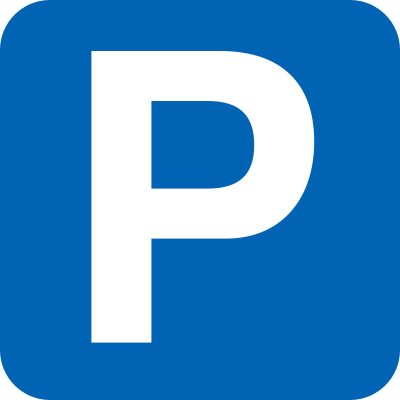 Please also read and follow our parking policy, and listen to any parking instructions you are given - and respect that everyone marshalling the parking are parent volunteers. Anyone blocking access to homes or restricting ambulance access will be reported to the police. Come and play the A-Plan Insurance passing challenge up by the clubhouse for a chance to win prizes. 5. Congratulate the opposition and make their supporters welcome. Big match for the U15 Girls who look likely to win Surrey Cup if they win on Sunday, and they have had 3-4 players picked for the Surrey squad too. Wonderful effort from the girls so some extra support would be great. 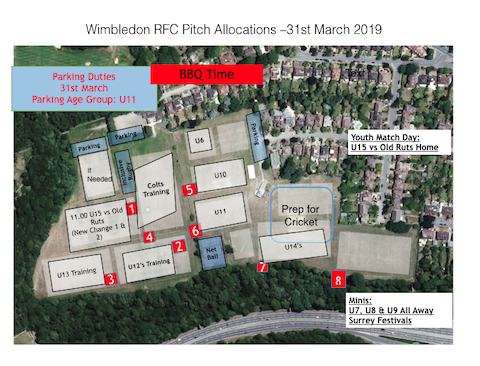 Please note the pitch marked for cricket prep and avoid this area. Plenty of space so should not be an issue. 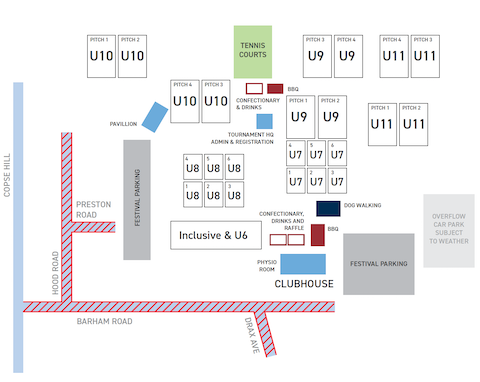 If you're visiting, please be good enough to follow our parking policy Netball marshalling the parking this week. Quiz night has been postponed - email social@wmrfc.co.uk if you have paid and need a refund. Most of the minis are away at Guildfordians - U6 and Inclusive at home. 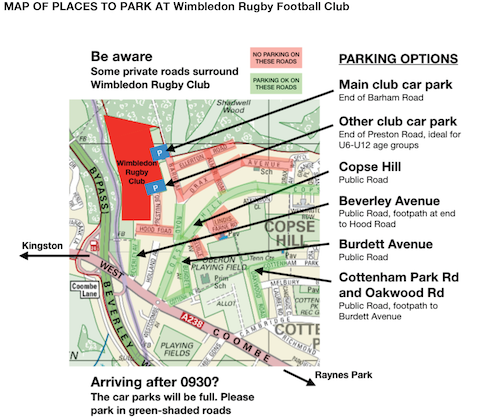 Car parking is the U12s (not U6s as marked). Don't forget to book your tables for the quiz night on March 15th. 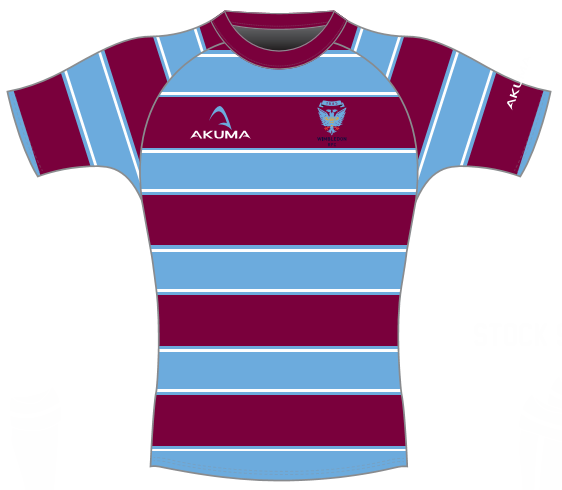 Email social@wmrfc.co.uk for info. John Woods writes to share news that eight of our girls are now in the County squads at either under 15s or under 18s (see roll of honour below). That's a great achievement in a very competitive county and a tribute to our girls and their coaches. 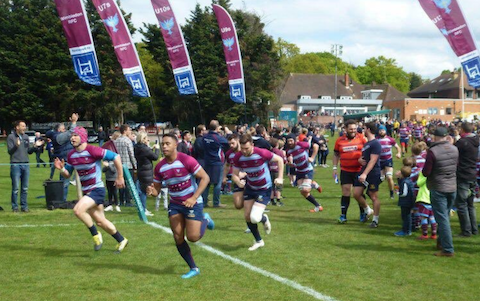 You can see the u15s in action at home this Sunday against Chobham alongside a number of other youth games. 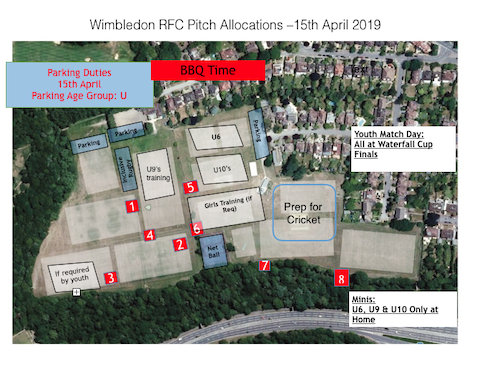 Just about all the minis are away this Sunday - U6 and Inclusive at home, the rest at Esher except the U10s who are on tour - hope you have a brilliant trip.